After two years of pleading I finally agreed to guide my daughter Hillary up Mt. Rainier. I recruited my good friend and climbing partner of 28 years Tim Hagan, whom my daughter had known her whole life. Even though Tim and I had shook hands and agreed that we would not climb Rainier again (which we had done on a couple of occasions once reaching Rainier’s summit) he was more than willing to help with Hillary’s goal. I set up a hiking training program and over several months Hillary and I were in the local hills quite extensively. After teaching her the basics of glacier travel and ice axe arrest we needed a mini Rainier and Mt. Baker was perfect. We invited another friend Ken Kisch to join us and on June 4th the four of us drove to the mountain and began the climb. 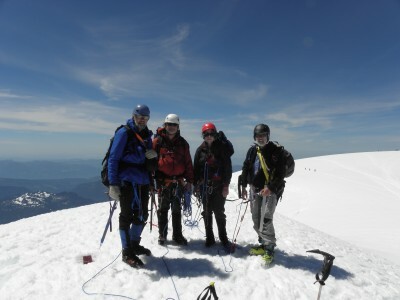 We reached the summit the following day in beautiful weather. I was quite proud of my daughter. It looks like she has what it takes.